Ximelagatran (Exanta) not Recommended by FDA Advisory Panel, Causes M.I.s? Because of these concerns, the approval of the drug was not recommended for any of the three proposed indications (stroke prevention in atrial fibrillation, venous thromboembolism prophylaxis following orthopedic surgery, and extended secondary prophylaxis following usual treatment for acute deep vein thrombosis). You can get more information on the marketing and financial side of these issues by visiting http://www.thestreet.com and doing a search for "Exanta". For those who would like to review the documentation on which the FDA panel based its recommendation, such documentation can be accessed at http://www.fda.gov/ohrms/dockets/ac/04/briefing/2004-4069b1.htm. The information provided in this posting is based on this FDA document. The concern about liver toxicity was expected because studies clearly documented that approximately 6% to 9% of patients on long-term therapy develop a significant elevation in their liver enzyme levels. The clinical significance of such elevations in liver enzymes remains uncertain. The concern about an increased risk of M.I. or other coronary artery events, however, was more surprising. The FDA document allows one to review the myocardial infarction and/or coronary artery event rates by types of patients studied. 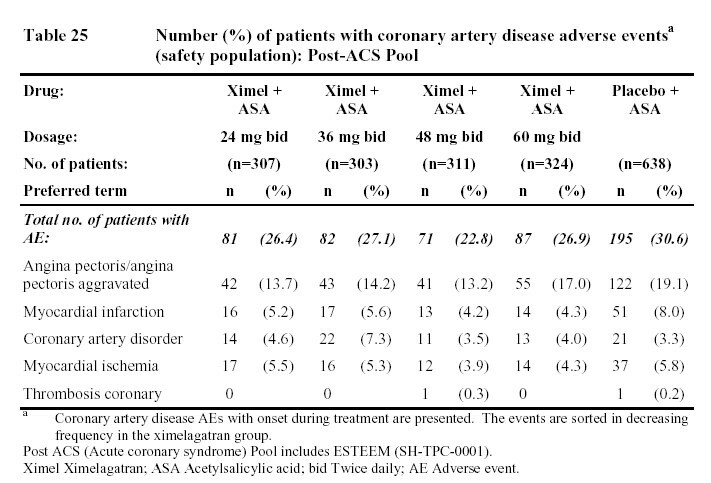 For surgical patients who received 36mg of ximelagatran twice daily for a relatively short period of time, the event rates are presented in the Table 1 below, which was created by the author of this note from data presented in the FDA documentation. In addition to the data in Table 1, there were 1,097 surgical patients who received a lower dose of ximelagatran (24mg twice a day) and were compared with 1,081 patients who received warfarin. Although the author did not find specific data on these additional patients, the FDA report indicates that similar numbers of events were seen in those patients enrolled in the lower dose ximelagatran studies. Although the M.I. 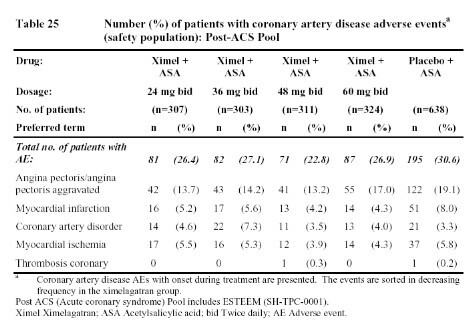 rates seen in these surgical patients are not large, it is not unreasonable to be concerned about 3 to 5 additional M.I.s in approximately 2,000 surgical patients treated with ximelagatran 36mg twice daily if the difference is indeed real. Perhaps further data and/or analysis will help resolve this concern. The first table below from the FDA document (Table 22) summarizes the data from the stroke prevention in atrial fibrillation trials (SPORTIF III and V). These two studies were significantly larger than the studies in surgical patients and followed patients for a longer period of time. Even so, the rate of coronary events with ximelagatran was only minimally higher than that seen in the warfarin patients. 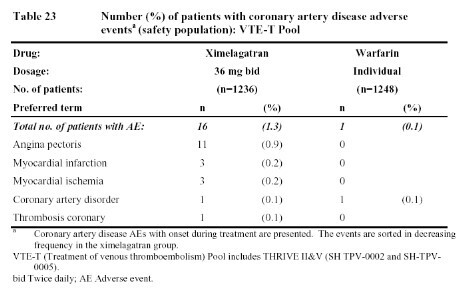 In contrast to the larger atrial fibrillation data base, the data in Tables 23 and 24, from studies of deep venous thrombosis (DVT) treatment and extended secondary prophylaxis do show more coronary artery events reported with ximelagatran than with warfarin (in the treatment study) or placebo (in the extended secondary prophylaxis study). 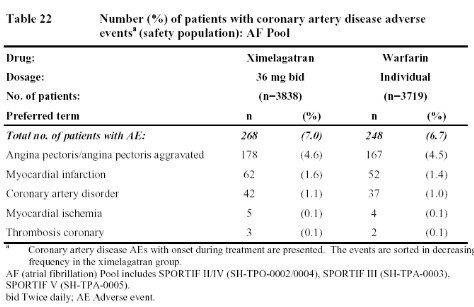 Finally, the study evaluating the addition of ximelagatran (or placebo) to aspirin for therapy following an acute coronary event found that the addition of ximelagatran reduced the incidence of coronary events more than that achieved by aspirin alone. Obviously, all of these data leave one a bit confused. 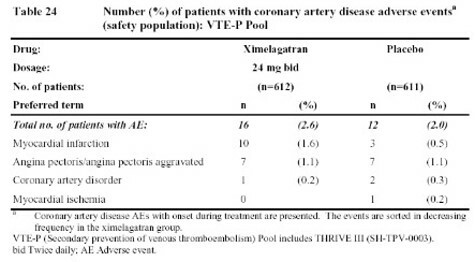 Does ximelagatran increase the risk of M.I. 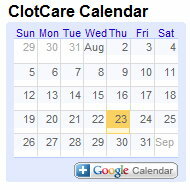 as suggested by the data from patients undergoing surgery (Table 1) or who have had a deep vein thrombosis (Table 23 & 24)? If so, why were there not more M.I.s seen in patients with atrial fibrillation (Table 22)? 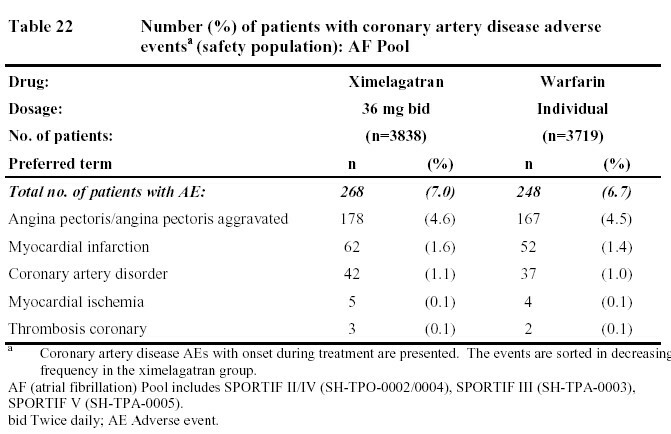 And if ximelagatran increases the rate of M.I.s, why did the addition of ximelagatran to aspirin reduce such events in patients with acute coronary events (Table 25)? 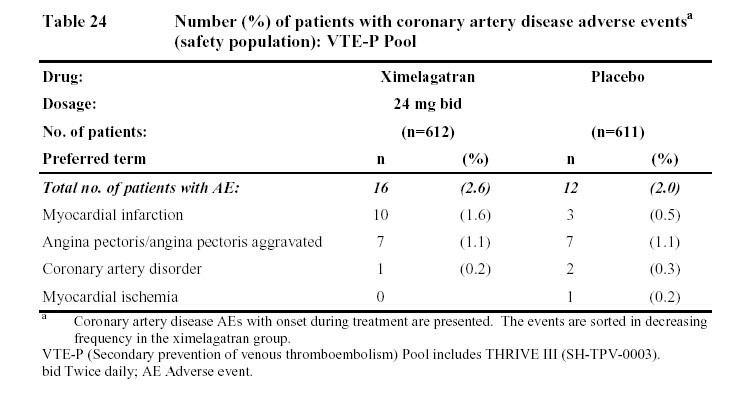 One possible explanation might be that ximelagatran simply does not prevent M.I.s as well as warfarin (since that was the comparator in the surgical studies, the DVT treatment trial, and the atrial fibrillation trials). 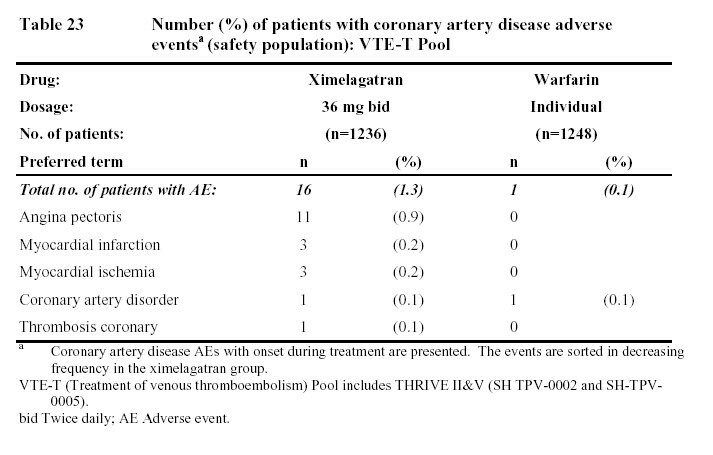 However, that would not explain the higher rate of coronary events in the extended, secondary DVT prophylaxis trial since placebo was the comparator in that case (Table 24). But if ximelagatran increases the risk of M.I. when compared to placebo (rather than warfarin), then why did it not increase the risk of coronary events when added to aspirin. Some have suggested that, perhaps, any harmful effects of ximelagatran may have been blunted by the use of other cardioprotective drugs in patients enrolled in the atrial fibrillation and acute coronary syndrome studies. Whether ximelagatran really does increase M.I.s in some patient groups while reducing M.I.s in others must remain an enigma until more data and/or new mechanisms are uncovered. Please note that the Table 22 below follows Table 1 because Table 1 was created by the author, and the other tables were taken from the FDA document located at http://www.fda.gov/ohrms/dockets/ac/04/briefing/2004-4069b1.htm. To view any of the FDA tables in larger print, simply click on the table and a larger copy will open in a separate browser window.